Your mission is your focus. Providing the power for it is ours. Communications, surveillance, and medical equipment are only as reliable as their power source. A Solar Stik alternative energy system is an autonomous source of power. If the grid goes down or the generator fails, our customers still have the power to complete their missions, anywhere in the world. A conversation is the best way for us to understand your unique power needs. We will work with you to create a tailored system to support your application. Have peace of mind knowing you have a reliable and proven power solution in place. We design and build portable power solutions. The components that comprise our systems are human portable and specifically engineered for the 1 kW to 10 kW power spectrum. The Solar Stik System can adapt to meet specific power needs and changing environmental conditions. 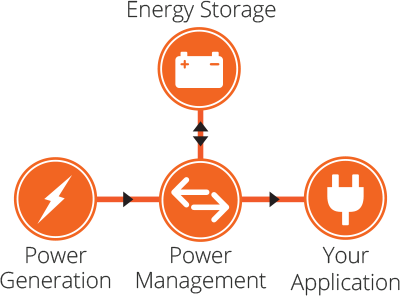 The open architecture design with easy-to-use, Plug & Play connections gives users the flexibility to incorporate advanced technologies and select power generation, energy storage, and power management options to create an optimized configuration for the application. Our power systems can be scaled up or down as conditions change. All components in our system can quickly be daisy-chained together with an identical component, allowing users to balance system capabilities between power demands and requirements. Solar Stik Systems are ruggedized, durable, and provide power in the most punishing environments in the world. We apply MIL-810G Standards in the construction of the components integrated in our systems. The need for self-sufficiency while sailing inspired the design requirement of autonomy for all Solar Stik Systems. Our systems have the ability to operate independent of grid- or utility-produced power. A lantern’s light guides us through dark or unknown places. There was no lantern when we started exploring the world of portable power—so we wrote STIKopedia as a guide for better understanding electricity basics and portable power systems. Click the lantern icon to explore a topic more deeply in STIKopedia .